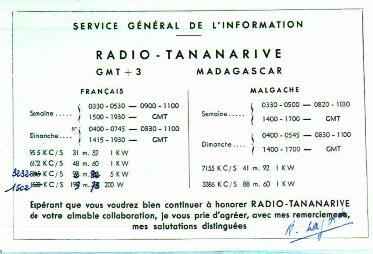 QSL card from Radio-Tananarive in Tananarive, Madagascar, for report circa 1954 on 9.515 mHz. Power was 1000 watts. This QSL was from Radio-Tananarive when Madagascar was still a French colony. It was for the French language service on 9.515 kHz.